There are six esoteric cults within the Zuni religion, each having their own priesthood, rituals, religious paraphernalia, and special times and places for worship and ceremony. The Cult of the War Gods celebrates the Ahayuda, the twins of A'wonawilona, who came to the people when military leadership was badly needed. The Bow Priests care for the kachinas of this cult, and can be construed as the Warrior-Priests who deal with both religious concerns and the secular issues of war, crime and aggression. 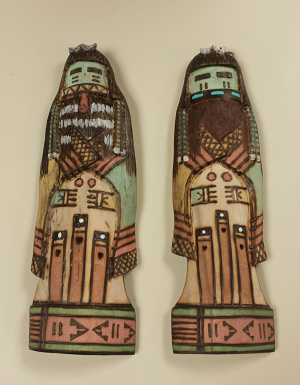 "Warrior Priest Kachina and Redbeard Longhair Kachina" by anneheathen is licensed under CC BY. 2000 Native Peoples of the Southwest. Albuquerque: University of New Mexico Press.